The Rabbit Super-Aerating Decanter System is an essential addition to any wine lover's collection. This wine aerator set includes a hand-blown crystal decanter, crystal glass wine spray funnel and a super fine sediment screen. The innovative system breaks red wine down into tiny droplets that spray down sides of the decanter, picking up oxygen that enhances both flavor and aroma. The wine funnel separates wine into micro-particles to achieve enhanced aeration. A super-fine sediment screen filters out sediment as fine as a millimeter. The decanter should be hand-washed only; all other pieces in the set are dishwasher-safe. This wine aerator set includes a hand-blown crystal decanter, crystal glass wine spray funnel and a super fine sediment screen. The innovative system breaks red wine down into tiny droplets that spray down sides of the decanter, picking up oxygen that enhances both flavor and aroma. The wine funnel separates wine into micro-particles to achieve enhanced aeration. A super-fine sediment screen filters out sediment as fine as a millimeter. 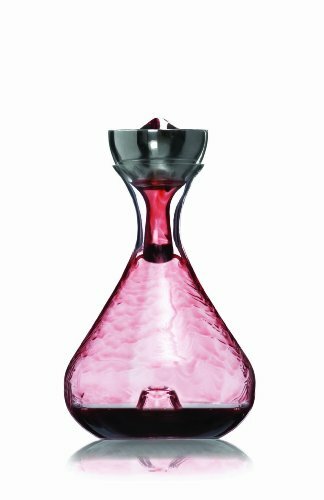 The decanter should be hand-washed only; all other pieces in the set are dishwasher-safe.